Alpine Flower is the second pattern from Holiday in Zermatt, a collection of four colorful cozy hats for the whole family. 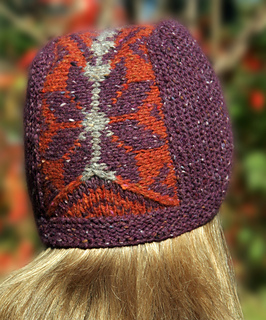 This hat’s unique construction makes a small bit of colorwork the focal point, while the garter stitch assures it will be a warm and cozy cap. 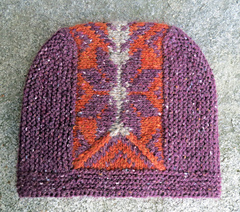 The hat begins with a color work panel knitted in the round, with decrease lines that create a rectangle. 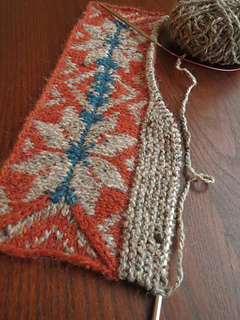 Then, stitches are picked up on the long sides and garter stitch short rows are worked to shape the hat. 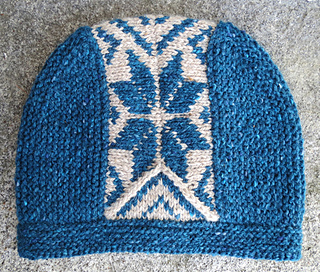 Finally, stitches are picked up and knit down to create the brim. Contrasting color 2 is optional. The hat can be worked in just two colors by substituting CC1 for CC2.